Guidance through every important area of tax planning for S corporations, offering analysis of relevant Code sections, regulations and rulings, and more. 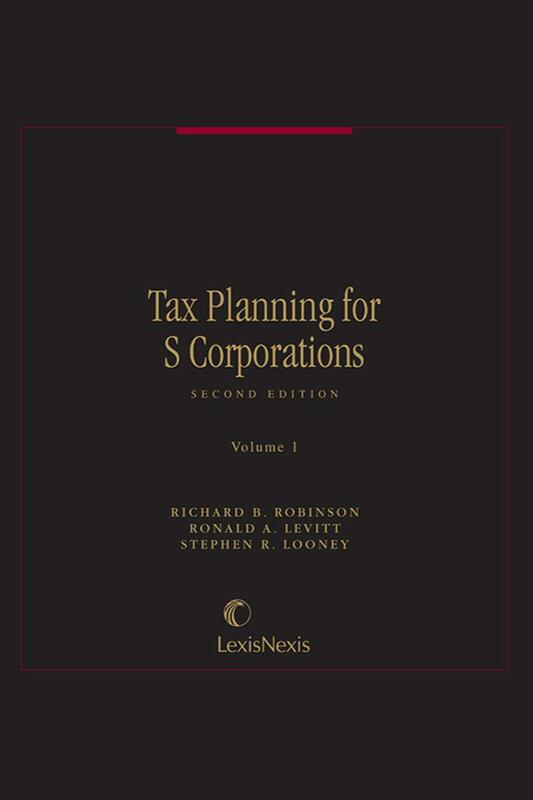 This practical 2-volume set provides step-by-step guidance through every important area of tax planning for S corporations, offering analysis of relevant Code sections, regulations and rulings, together with flowcharts, case studies, checklists, computational examples, planning tips and more. RICHARD B. ROBINSON, J.D., LL.M. STEPHEN R. LOONEY, J.D., LL.M. 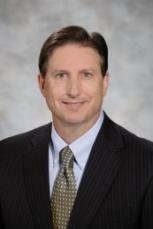 RICHARD B. ROBINSON, J.D., LL.M., is a shareholder in the law firm of Robinson, Diss and Clowdus, P.C. in Denver, Colorado. He earned his J.D. at the University of Denver and his LL.M. in Taxation at New York University. He is an Adjunct Professor in the Graduate Tax Program at the University of Denver. Additionally, he has lectured for CPE programs around the country. His articles have appeared in The Journal of Taxation, Estate Planning, The Colorado Lawyer, Taxes--The Tax Magazine, The Practical Accountant, and The Journal of Taxation of S Corporations. 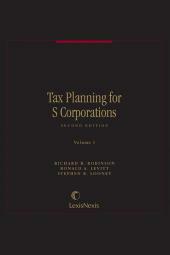 He is co-author of How to Do Tax Planning for S Corporations, published by Matthew Bender as part of its Accountant's Workbook Series; and co- author of Federal Income Taxation of Corporations, Sixth Edition, published by The American Law Institute, American Bar Association, and Committee on Continuing Professional Education. RONALD LEVITT, J.D., LL.M. is a shareholder in the firm of Sirote & Permutt, P.C. in Birmingham, Alabama. He earned his J.D. at the University of Alabama and his LL.M. in Taxation at the University of Florida. He is listed in Best Lawyers in America in Taxation (1994); Leadership Birmingham (1996); Fellow, American College of Tax Counsel; Adjunct Professor: University of Alabama School of Law LL.M. in Taxation Program (Partnership Taxation); Cumberland School of Law (Partnership Taxation). He is a frequent instructor for the American Bar Association Tax Section, the New York University Institute on Federal Taxation, the Alabama Society of CPAs, the Tennessee Tax Institute, the Federal Tax Clinic, Inc., the Birmingham Tax Forum and other organizations. Publications include: "Back to Back Loans," presented at the 65th New York University Institute on Federal Taxation in October/November 2006; "The Uncertainty of Basis Increases in Connection with Back-to-Back Loans to S Corporations," published in Business Entities magazine, January/February 2007; and "Redemptions and Purchases of S Corporation Stock," presented at the 63rd New York University Institute on Federal Taxation in October/November, 2005. STEPHEN R. LOONEY, J.D., LL.M. is a shareholder in the firm of Dean, Mead, Egerton, Bloodworth, Capouano & Bozarth, P.A. in Orlando, Florida. He earned his J.D. at the University of Missouri and his LL.M. in Taxation at the University of Florida. He is a Board Certified Tax Lawyer, The Florida Bar and a Certified Public Accountant, State of Missouri. 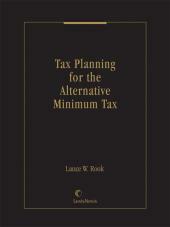 He is a former Chair of the S Corporations Committee of the American Bar Association--Tax Section. 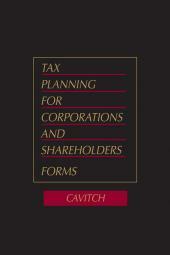 He has written extensively on a variety of tax issues. His articles have appeared in a number of professional publications, including the Journal of Taxation, The Tax Lawyer, the Journal of S Corporation Taxation, the Journal of Partnership Taxation, the Journal of Corporate Taxation, and the Business Entities Journal.